For Dogs and Cats up to 30 lbs. A Concentrated Dietary Supplement containing a comprehensive blend of essential fatty acids (EHA), vitamins, and antioxidants for dogs and cats. Omega Tri-V Caps is recommended to help support healthy skin and coat in dogs and cats. 1 to 2 Capsules daily, for pets up to 30 lbs. OTHER INGREDIENTS: Fish Oil (source of Omega-3 Fatty Acids*), Cod Liver Oil (Source of Vitamin A & D), Gelatin, Glycerin, Water. My original review is Feb 14, 2014. I still feel the same but this time I ordered, I got a phone call to confirm my address mailing address wasn`t the same earlier this year. GREAT customer service! I appreciate the call and making sure they had the correct address. The product was exactly the same as what I got from the vet. BIG difference is I paid about $7 at Petstruly compared to $40 at the vets. The product was exactly the same as what I got from the vet. BIG difference is I paid about $7 at Petstruly compared to $40 at the vets. I bought 2 bottles and with shipping it all came out to about $22. I got twice as much product for one-fouth the price! Ordering and delivery were quick and easy. Product works as great for dry skin and coat conditioning. Previously used product was discontinued and we switched to this one on vet`s recommendation. Seems to be working well, allergies still under control! 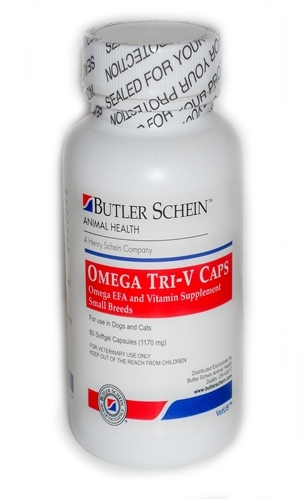 When our shih tzu`s coat started getting kind of dry and lusterless, our vet recommended the Tri-V fish oil caps. They have brought a healthy look and feel back to the coat. fast delivery. Products arrive in good order. I`ve had both of my dogs on this product for several months; it really does improve skin & coat condition, and significantly reduces shedding. Less itchiness with allergy-inclined dogs, as well. haven`t yet tried the product, but the ordering process and quick receipt were a plus. Still working on our last bottle and will be trying this product shortly.